Almost each one of us has been watching the YouTube videos for a variety of purposes. Whenever we think of cooking a new dish, we automatically search for recipe videos on YouTube. This is not the only option but it extends to all areas such as technology, art, science, architecture and finance. We are quite familiar with the YouTube and it is from the technology giant, the Google. Then what does this YouTube Red means? Is it an exclusive app or service? Let us discuss those points in this article apart from looking into the actual differences between YoutTube and YouTube Red. It is a video sharing App and is a product of the Google. You can upload videos to it or watch video on it without any restrictions. In some countries, Google had allowed people to download the videos for a particular duration of time. But the only annoying fact is the ads! You need to bear with it as it is a free service from Google. What can you do with YouTube? You can watch the video of others or share your own videos on the Internet. It even helps you to create movies with the availability of Edit facility. The presence of 3D and HD (High Definition) technologies, you can always view or share higher quality videos. There is an interesting element associated with the YouTube and is that you can even rate or comment on the videos of others. This feature helps others to pick the best videos from the rest. It also allows you to watch files of full-length even from your devices. You can watch it in any of devices such as desktops, laptops, Smartphone, Tablet, etc. You can also mark your favorite videos and it helps you while you search for it again. There is also an excellent feature with the YouTube and it is the Privacy feature. You can set a list of people and only those are allowed to view your contents. It ensures your privacy in a great manner. It is just a paid version of the Google’s YouTube and you can watch videos without the disturbance of ads. This is not the only advantage that you get for paying money but you can also enjoy few other features. Let us discuss more of it in this article. 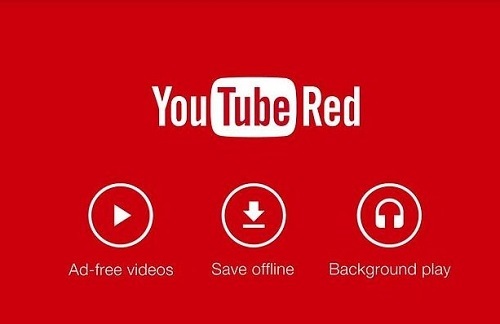 What can you do with YouTube Red? Everything you are allowed on YouTube, the same is possible with the YouTube Red. Then what’s special with this? It is a premium and paid version of the YouTube. It is absolutely better than the YouTube as it never displays ads when you view or share the videos. It just costs $9.99 per month and you can get the Google Play Music service along with it. The reverse is also applicable i.e. when you subscribe to the Google Play Music service; you would automatically get the YouTube Red subscription. YouTube never allows the video download in all the countries but it is possible with YouTube Red. So when you have the YouTube subscription, you could enjoy the offline videos at any time, downloaded from it. Also, the YouTube never supports the background playing of music. This means that whenever you open another app such as a game or dialer, the YouTube audio or video that you are presently watching gets stopped. But you could get rid of such a problem when you are a subscriber of YouTube Red. Most importantly, it is just an extended service with no ads, offline video facility and it allows playing music in the background. So it is not an exclusive App or so but just an extended service that you get with the YouTube for the amount you pay. Cost: The YouTube is a free App from the Google whereas YouTube Red is a paid App from the same provider. The latter costs $9.99 per month. Concept: The basic behind the YouTube is to watch and share video contents on the Internet. The same applies to the YouTube Red as well and you get few additional features here. For that premium service, you absolutely need to pay some money. Ads: We could not stop the annoying ads in the YouTube. Whether you like or not, you have to bear with those ads displayed while you watch or share videos. When you subscribe to the YouTube Red, you never get any ads and you could enjoy ad-free videos at any time! Offline Videos: With the YouTube, you could download the videos only in certain countries. Not every YouTube user could use this service. But with the YouTube Red, you could enjoy downloading videos at a time. So do enjoy the offline videos with the YouTube Red on all your devices. Playing Background Music: Have you ever tried opening another App such as a dialer or mail box while you watch a video on the YouTube? If you try it, then the YouTube stops playing the music at once. It means there is no support for playing background music in the case of the YouTube. But with the YouTube Red, you still could enjoy the background music without any interruptions. What happens when your device screen off? Just think that you are playing a video in the YouTube and you have crossed the screen timeout limit. So automatically the screen gets off. Now, you would neither be able to watch the video nor you could hear its sound. But this is possible with the YouTube Red even when your screen goes off! That’s a great advantage and you need not keep your screen alive all the time when you play music. Where available? The YouTube is available in all the countries where there is no blocking of Google products with Firewalls. But the YouTube Red is available only in countries such as Australia, US, Koreas, New Zealand, and Mexico. Video Resolution Options: In the YouTube, we generally won’t find options for the resolution of the videos that we watch. But with the YouTube Red, you could either choose the low resolution of 144 p, a medium resolution of 360 p, or a High definition resolution of 720 p.
Google Play Music: The normal YouTube never gets you a subscription to the Google Play Music, a music playlists service from the Google. But the YouTube Red subscription gets you access to it and you could enjoy in the reverse as well. That means when you pay for the Google Play Music, you could enjoy the YouTube Red services as well. Let us look at the differences in a tabular form. 1. Cost It is a free App from the Google. It is a paid App from the same provider. The latter costs $9.99 per month. 2. Concept The basic behind it is to watch and share video contents on the Internet. The same applies to here as well and you get few additional features here. For that premium service, you absolutely need to pay some money. 3. Ads You could not stop the annoying ads here. Whether you like or not, you have to bear with those ads displayed while you watch or share videos. When you subscribe to the YouTube Red, you never get any ads and you could enjoy ad-free videos at any time! 4. Offline Videos With this, you could download the videos only in certain countries. Not every YouTube user could use this service. With it, you could enjoy downloading videos at a time. So do enjoy the offline videos with the YouTube Red on all your devices. 5. Playing Background Music If you try opening another App while you watch a video or hear music in it, then it stops playing the music at once. It means there is no support for playing background music here. But with it, you still could enjoy the background music without any interruptions. 6. What happens when your device screen off? When your device screen gets off, you would neither be able to watch the video nor could you hear its sound. You need not keep your screen alive all the time when you play music here. 7. Where Available? It is in all the countries where there is no blocking of Google products with Firewalls. As of now, it is available only in countries such as Australia, US, Koreas, New Zealand, and Mexico. 8. Video Resolution Options We generally won’t find options for the resolution of the videos that we watch. You could either choose the low resolution of 144 p, a medium resolution of 360 p, or a High definition resolution of 720 p.
9. Google Play Music It never gets you a subscription to the Google Play Music. It gets you access to it and you could enjoy in the reverse as well. If you still find some more differences between YouTube and YouTube Red, then do let us know! Ramalan Harifa. "Difference between YouTube And YouTube Red." DifferenceBetween.net. August 21, 2017 < http://www.differencebetween.net/technology/internet/difference-between-youtube-and-youtube-red/ >.